Thank You for Your Interest in Picasso Shutters! We want you to be knowledgeable about your shutter purchase and other products that will accommodate your window covering needs. Your retail sales representative will provide you with information on ordering, as well as the manufacture, service and quality of our products. We know that you will be delighted with our shutter products. Our shutters add to the resale value of your home. They become an attractive part of your home. Shutters help control your home’s energy costs by reflecting heat away in the summer and maintaining heat in the winter. Our unique product lines enhance and coordinate with any dècor. Our traditional basswood shutters enhance the wood grain with any kind of finish technique. The popular MDF (Medium Density Fiberboard), our most affordable shutter, produces an almost piano-like finish with the same function and quality as the basswood. 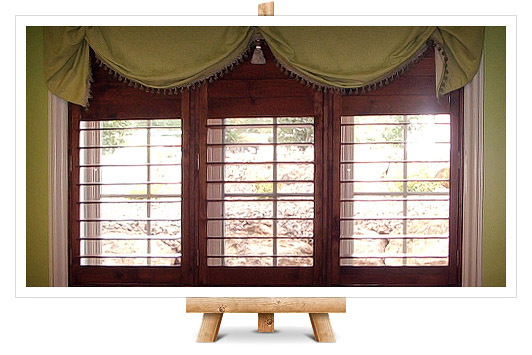 Our in-house specialty department creates beautiful custom shutters for windows of all shapes and sizes. Our Vista Shutter features the popular hidden rear control rod.